Upswing’s latest venture is an elegant, powerful portrait of loss, longing and a crisis of identity. This cross-discipline amalgamation of aerialism, animation and dance was partly inspired by the feelings of dislocation and disorientation experienced by creator Vicki Amedume after arriving in the UK as a young girl. Expanding on this to convey a broader sense of disconnectedness and isolation, Fallen is the story of a woman taken from her family and incarcerated as she awaits ‘processing’, coming to terms with her new life and with her grief. The audience accompanies her on her journey of anguish and acceptance and we are drawn into her fitful fantasies as she dreams of the son she’s left behind. Rather than follow a traditional storyline, Fallen is a series of vignettes, of visual images that convey an overall impression of a psychological state. The movement of the piece is symbiotic with Jules Maxwell’s atmospheric soundscape; harsh, chaotic, electrical discordances that complement the woman’s distress or confusion give way to lyrical chords and smooth cadences to accompany her more fluid, dreamlike motion. Lead artist Sera Adetoun gives a strong performance, both physically and emotionally. Whether lifting partner Garry Benjamin with as much ease as he does her, or effortlessly scaling aerial silks like a cat, she remains emotionally alive and responsive. 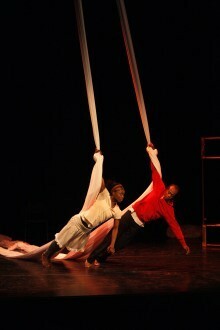 Amedume’s employment of circus techniques proves effective as an expressive aide to storytelling. The harness is used alternately to exaggerate and to restrict movement, creating a sense of fantasy and of dreams. One particularly poetic use sees the son suspended in the air as his mother is grounded, forever beyond reach of her outstretched hands. Likewise, there’s some beautiful imagery involving the silks – though the occasional wobble betrays the lead performers’ lack of formal circus training. There are some lovely moments in this largely sensory experience. It bursts into life in an explosion of energy: we hear bare feet running across the stage, the unexpected zip of a wire, and suddenly the lights slam on to reveal Adetoun’s character suspended horizontally from the ceiling, limbs stretched in every direction, frozen in animation. Ultimately, however, it never really lives up to the promise of its dramatic opening and the choreography feels rather repetitive before long. Because the scope is limited to the intensive exploration of an emotional space, the story doesn’t develop. As a pure, physical expression of a state, it fulfils its brief, but I would have appreciated a bit more in the way of narrative. London International Mime Festival continues at various venues until Monday 31st January. Find out more about Upswing.